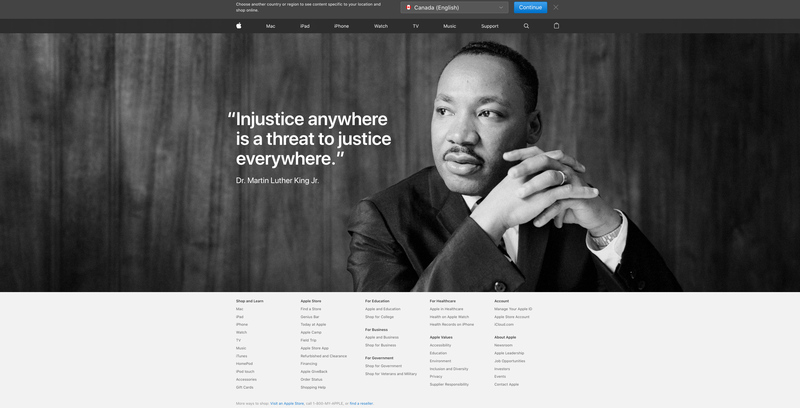 Apple is commemorating Martin Luther King Jr. Day with a cover photo and an iconic quote on the home page of its U.S. website. The quote is “Injustice anywhere is a threat to justice everywhere,” which Martin Luther King Jr. wrote when he was jailed in Birmingham, Alabama. Cook also took the time to help out the San Jose community with Dorsa Elementary students and Apple volunteers. Apple has suggested four apps to encourage other people to engage with their community as a way to honour Martin Luther King Jr.
GoFundMe and Golden Volunteer Opportunities are two obvious choices, because these are used to help others, whether it’s physically or financially. Airbnb and Eventbrite are the other two apps, since the former has a social impact section and the latter involved with charities and causes. MLK: In His Own Words is also promoted on the American App Store. Martin Luther King Jr. Day is an American federal holiday that commemorates MLK’s birth. King is known for his non-violent approach to protesting racial discrimination through his ‘I have a dream’ speech, one of the most iconic statements in American history.